The dunes studied are those at Peck's Manhattan Beach, between Redondo and Venice, California. They are practically undisturbed, and therefore lend themselves readily to safe investigation of their flora. These dunes rise to a height of 150 feet above sea level in a horizontal distance of three-quarters of a mile and descend abruptly 75 feet in about 100 feet of horizontal distance. The physiography is referred to as windward slopes, as summits, or as leeward slopes the configuration of the dunes having been determined by the sea winds. Quadrat counts covering the dunes were made in March 1913, each quadrat being 10 meters square. It is seen that the dominant plant in the first three quadrats [1,2,3] is Gaertneria, [Ambrosia chamissonis] which is the pioneer plant to encroach on moving sand. It establishes itself and is followed by Abronia umbellata in more or less protected places. 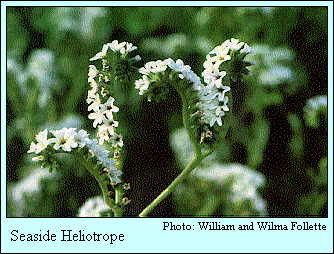 As Abronia umbellata is secondary in the first three quadrats and dominant in the fourth it seems to rank second to Gaertneria as a sand binding plant. In the fourth quadrat  Abronia umbellata is the dominant plant with Eriogonum [Eriogonum parvifolium] and Lupinus as secondaries. Gaertneria [Ambrosia chamissonis] has lost its place and become a relict perhaps of former formations or is of accidental occurrence. Quadrat number five  shows Adenostoma [Ericameria ericoides] as dominant and Abronia umbellata and Cheiranthus [Erysimum insulare suffratescens] as secondaries. Adenostoma [Ericameria ericoides] appears suddenly and in so doing rather upsets the series of dominants and secondaries. It however is peculiar to the summit and leeward slopes and occurs just as markedly as the quadrat count indicates. It does not occur on the windward slope. It is possible that Eriogonum [Eriogonum parvifolium] should also be named as a secondary in this quadrat. Quadrat six  gives Cheiranthus [Erysimum insulare suffratescens] as dominant by numbers and Adenostoma [Ericameria ericoides] and Eriogonum [Eriogonum parvifolium] as secondaries. The size of the plants however place them in reverse order. In quadrat seven  the most conspicuous plant of the dunes in dominance is Lupinus. [Lupinus chamissonis] The land is so nearly occupied that to name a secondary would be stretching the meaning to apply to mere numbers. The two kinds of competition exist, that between plants and their environment and that between plants themselves. In general the competition on the windward slope is environmental that of the summit a combination of environmental and vegetative and that of the leeward slope mainly vegetative. In both cases where the competition is greatest the number of species is the least. In case of environmental competition the plants do not cover the surface of the soil, but in the case of vegetative competition the surface is covered in proportion as the competition is close. In other words, open formation occurs on the windward slope and slightly so on the summit, while closed formations are the rule on the leeward slope and at the foot of the dune on that side. Gaertneria [Ambrosia chamissonis] and Abronia umbellata seem to be the most successful in the environmental competition and Lupinus [Lupinus chamissonis] in plant competition. The regions giving the greatest number of species in the counts seem to be where there is an intermediate stage in competition and stabilization. It will be noted that the greatest number species occurs in counts taken on or near the summit of the dune. This is peculiar to dune formations. The combination of plant and vegetative competition is caused by the constant of sand and the tendency toward complete ecesis. The existence of this double condition tends to permit the gathering of representatives of all the species on the dunes near the summit excepting Abronia maritima which is limited to within about one-quarter mile from the sea. The September aspect of the dune is very different from that of the spring. Most of the plants are in a drought resisting condition. Those flourishing in September are Eremocarpus [Croton californicus], Sphaerostigma [Camissonia cheiranthifolia var. suffriticosa], Eriogonum[Eriogonum parvifolium]. The rest of the plants that made such a showing in the spring appear dead but still remain rooted for next season's growth. The leaves and stems of those growing are grayish in color and largely tomentose, a condition peculiar to the drought resisting plants of the dunes. The leaves of Eriogonum [Eriogonum parvifolium] are more revolute than in the spring, thereby reducing the synthetic and transpiring surface. New dune regions where the above plants have not grown show the order of succession to be given as above. In evidence of this the fact may be stated that the owner of the sand spit connecting the mainland with Coronado near San Diego, California, sowed seeds of Abronia umbellata and [Ambrosia chamissonis] on the barren spit and after two years all the plants that occur on the dunes are present in the same relations as have been given in the quadrats above.